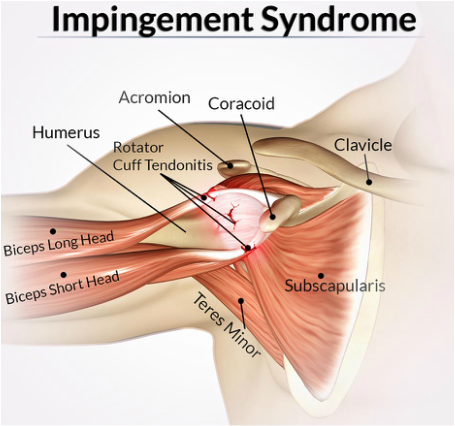 Impingement syndrome is usually caused by the irritation and inflammation of the muscle and tendons of the rotator cuff (Supraspinatus, Infraspinatus, Teres minor and Subscapularis). As they pass under the acromion and through a narrow bony space called the subacromial space, the tendons rub along the bone causing impingement. Over time, this can lead to a thickening of the tendon(s), which can decrease the space in which the tendon travels, further impinging the tendon. Therapeutic Exercise focusing on scapular stabilization, pectoralis length, and posture.